Born 3 April 1992 in Grozny, Chechnya, because of war, her family had to move to Volgodonsk. Yuliya grew up there, and there she began to train in one of the local sports schools, under the guidance of her father, Andrei Mikhailovich Yefimov. Prior to 2011, the family lived in Taganrog, where Yuliya trained with the honored coach of Russia Irina Vyatchanina. In March 2011, the athlete went to the U.S., where she trains in California with David Salo. Yuliya is a three-time European champion in 2007 FINA Short Course (50, 100 and 200 meters breaststroke), champion (200m breaststroke) and silver medalist (50 m) of the European Championship in 2008. She is a European record holder and European Championships in the 100m breaststroke. 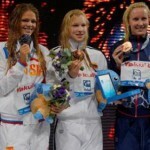 Participant of the 2008 Olympics in Beijing, Yefimova won the 4th place in the 100m and 5th – 200 m breaststroke. 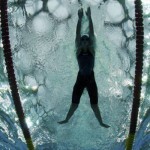 At the Olympic Games in London in 2012 she won a bronze medal in the 200m breaststroke with a score of 2:20.92. In 2008, the All-Russian Swimming Federation recognized Yuliya Yefimova the best swimmer of the country and “Discovery of the Year.” Yuliya won 2 highest standard medals at the European Championships in Aquatics in 2010 in the 50 and 100 meter breaststroke. (Update 14 August 2013). In 2013, at the World Championships in Barcelona, ​​Yuliya won the gold medal in the 200 meters, beating Ricky Pedersen and Micah Lawrence, simultaneously updating the record of Russia 2.19,41. 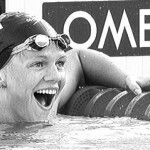 The 50m breaststroke world record in the updated preliminary heats – 29.78. In the final time showed 29.52 and beat Lithuanian athlete Ruta Meylutite, having become a triple world champion in the fifty-meter pool.